A Republican representative in Hawaii, cited as a rising star on the right, told NBC News Thursday she no longer felt she was in the position to defend the GOP, one day after her colleagues ousted her as House minority leader. 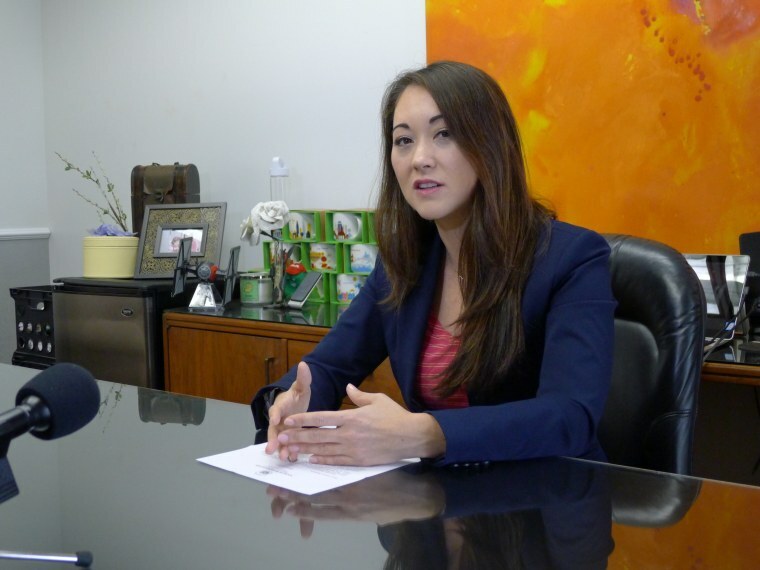 Rep. Beth Fukumoto, who served as the Hawaii House minority leader since 2014, said she became the subject of intense criticism from her caucus after her participation in the Women's March in Honolulu on Jan. 21, where she spoke out against the racism and bigotry that had become associated with the Republican Party, as well as the rhetoric and actions of President Donald Trump. "There were many little girls watching [the election] who walked away believing that you can bully people and still win," Fukumoto told NBC News. "And what I said at the march was that regardless of who we voted for in the election, it was all of our responsibilities to show those same kids that in the end kindness and respect should always win." Within 24 hours of her speech, Fukumoto said she was receiving calls and texts from her colleagues to meet, as well as fielding calls for her resignation for speaking out against the president. On Wednesday, all but one of Fukumoto's colleagues voted to remove her from her leadership position. "What ended up being very problematic for me was that my caucus and others said, 'If you want to stay in leadership, then you need to make a commitment to not criticize the president for the remainder of his term,'" Fukumoto said. "And with what we've been seeing in the news with the different executive orders coming out every day, I didn't believe I could make that commitment." Fukumoto added that she disagreed with the direction the Republican Party was heading in. "It seems to be punishing dissent, and when you have a political party, you need dialogue," she said. This is not the first time Fukumoto has spoken up in opposition to her party. In an op-ed for NBC News last year, the 33-year-old legislator — who, until Wednesday, was the country's youngest female caucus leader — described her previous clash with a Republican colleague who accused her of not being "truly Republican because my tone or stature is not oppositional enough." "Even though many of us believe [the GOP is] still something worth saving, we don’t think we that we can do it." Fukumoto isn't alone in her perspective. In 2014, her predecessor, former House minority leader Rep. Aaron Ling Johanson, announced his decision to leave the Republican Party and became a Democrat, saying he felt the GOP had become "more narrow in their demands for ideological purity." "Rather than being focused on remaining the loyal opposition as some would like, and I understand that some Republicans really want that," Johanson said at the time, according to Hawaii News Now. "That's not who I am, that's not who I committed to be. And I just look forward to making a collaborative, constructive and positive difference." Johanson continues to serve in the Hawaii House of Representatives, and was re-elected last year as a Democrat. Fukumoto said she had experienced Johanson's thought process closely at the time as the floor leader, and that both she and Johanson had hope the party could change. In a letter to her constituents this week, Fukumoto announced her desire to leave the GOP and asked for their comments and feedback before making anything official. If she leaves the Republican Party, Fukumoto told NBC News she would look to join the Democrats. In a statement released Wednesday, Hawaii Republican Party Chair Fritz Rohlfing urged Fukumoto to remain in the party even though she no longer was the leader. "I believe she still can fulfill an important role as a Republican member of the State House," Rohlfing said. But, Rohlfing added, should Fukumoto choose to leave the party three months after being re-elected as a Republican, he felt it was only appropriate that she immediately resign from her seat entirely so the GOP could have time to propose replacements to Gov. David Ige. During Wednesday's vote, fellow Republican Rep. Cynthia Thielen, who also spoke during the Women's March, criticized the caucus for punishing Fukumoto "for participating in the democratic process." Thielen went on to defend Fukumoto's leadership and praised her contributions to the Republican Party. Adding that although she herself had no plans to leave the party she's been a member of for more than six decades, Thielen's voice broke as she criticized the GOP for pushing Fukumoto out. "I'm going to be there and continue that fight but, God, I am sorry to lose our minority leader, someone I so deeply, deeply respect — the face of Republicanism as it should be, but it won't be anymore," Thielen said. In her 2016 op-ed, Fukumoto wrote, despite the increasing partisanship and divisiveness, she believed the GOP was worth saving. Today, she isn't so sure. "I think there are a lot of Republicans feeling that way right now, that the forces against change are just so strong and that even though many of us believe there’s still something worth saving, we don’t think we that we can do it," she said.